My last post concluded the outfit series from my rental box c/o Couture Sqd. I returned all my items on Friday and surprisingly I was not too sad after I left my package at the post office. Usually I am trying to give items another chance to prove that hey belongs in my wardrobe, but I was able to let go of these items pretty easily. I guess it must be because when I go shopping, I buy what I love and that makes the relationship with my clothes deep and complicated. Having the items picked out for me, even if I did indicate my preferences, was like being set up on a blind date. Sure, your friend knows your type and wants what is best for you, but its not the same as discovering and falling in love with someone, or an piece of clothing, on your own. With all that being said, magic does/can happen on a blind date. I would say that the two tops from the Mixed Print option were not exactly my cup of tea, but I was able to create some amazing outfits because it forced me to think outside of the box - no pun intended. I really liked the two dresses from the Work Ready option. The orange and black color block dress had just enough class for work and an equal part of sass for a night out. It was also a dress that helped me venture into the world of exotic skins with its faux python skin belt. I tend to avoid this trend, but it looked great in this small amount. The little white Tahari dress was the crowning jewel of the box. Not just because it is by a classic designer, but also because of the shape and fit. It made me feel like a million bucks and would have made a great addition to my wardrobe. Unfortunately I don't have the available closet space and I wasn't completely in love with it. Overall, my experience with Couture Sqd's service was great. It was easy to sign-up and pick out the types of clothes I wanted to try out. The return process was really simple to because they provide the return shipping label and take care of the dry-cleaning. Along with my box came the price break down of each item. It would indicate if you were the first to be wearing an item and how much an item would cost at its discount price. So in the end, all you have to do is enjoy what comes your way and keep something if it really spoke to you. It's a great way to experiment with trendy items and with no monthly subscription fee. You pay by the box, so rejoice fellow fashionistas - there is a way to always wear something different without breaking the bank! 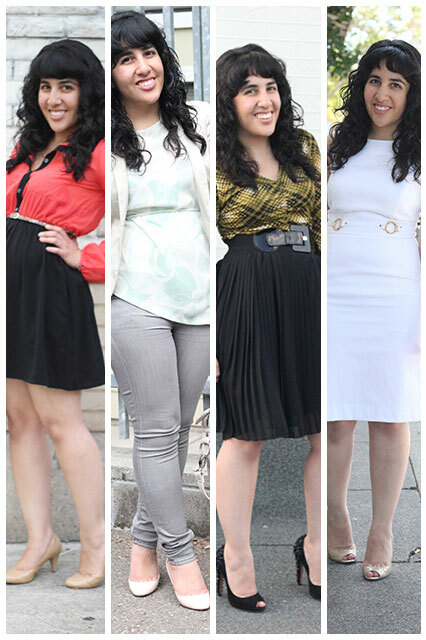 I hope you enjoyed my outfit posts featuring items from Couture Sqd and my personal opinion of their service. If you order a box let me know! I'd love to see what's inside your box and/or how you style the items. And of course, if you fall in love with something.